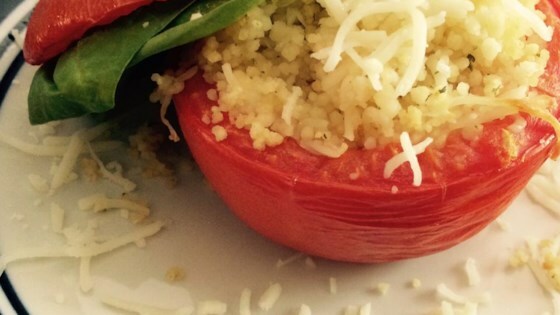 "Yummy and quick stuffed tomatoes." Preheat oven to 375 degrees F (190 degree C). Cut the fresh tomatoes crosswise in half and scoop out the pulp; set aside. Invert the tomato shells on paper towels to drain. In a small saucepan, bring the broth and sun-dried tomatoes to a boil. Remove the saucepan from heat and stir in the couscous. Cover and let stand for 5 minutes. Stir in the cheese, basil, mint and pepper. Then gently stir in the tomato pulp. Place the tomato shells in an 11x7 inch baking dish. Spoon the couscous mixture into the shells, pressing the mixture firmly into the shells. Bake at 375 degrees F (190 degrees C) for 25 to 30 minutes or until heated through. Deilicious, inexpensive and easy. What could be better? These were pretty good, I added fresh garlic. Next time I will leave out the mint.